← Weigh In: Slow and Steady Wins the Race? 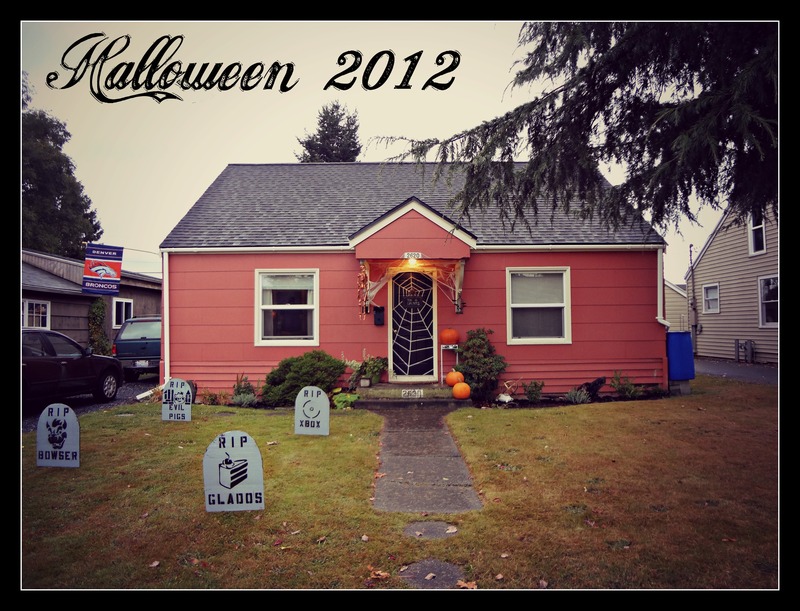 Our Halloween decorations aren’t that much different from last years. 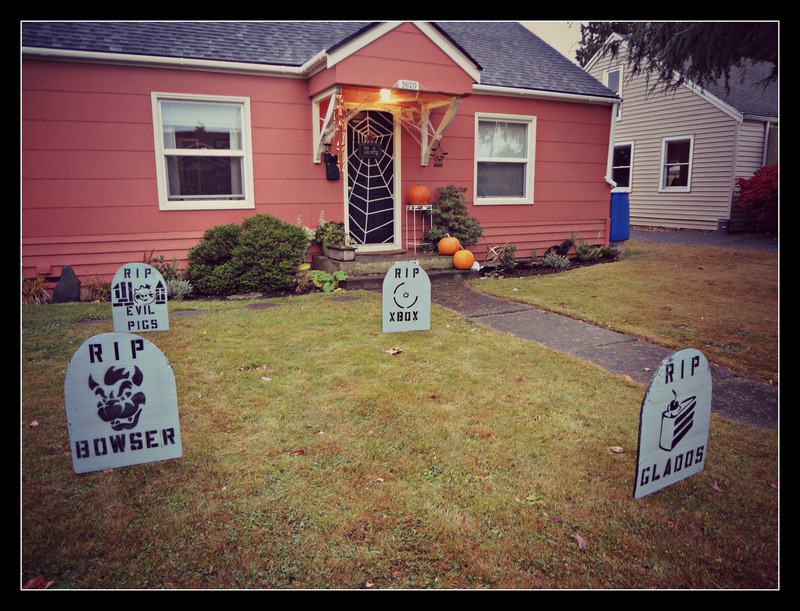 Mr. Gaunt put up his silly video game related tombstones (that only he finds hilarious) and the cobwebs, and skeleton are both back. 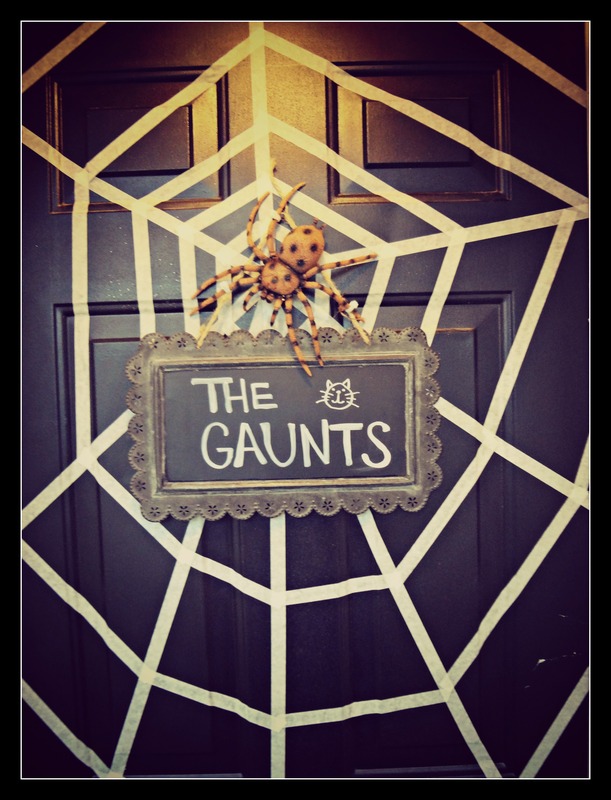 I did however get all sorts of crafty and made our front door one big spiderweb with masking tape! 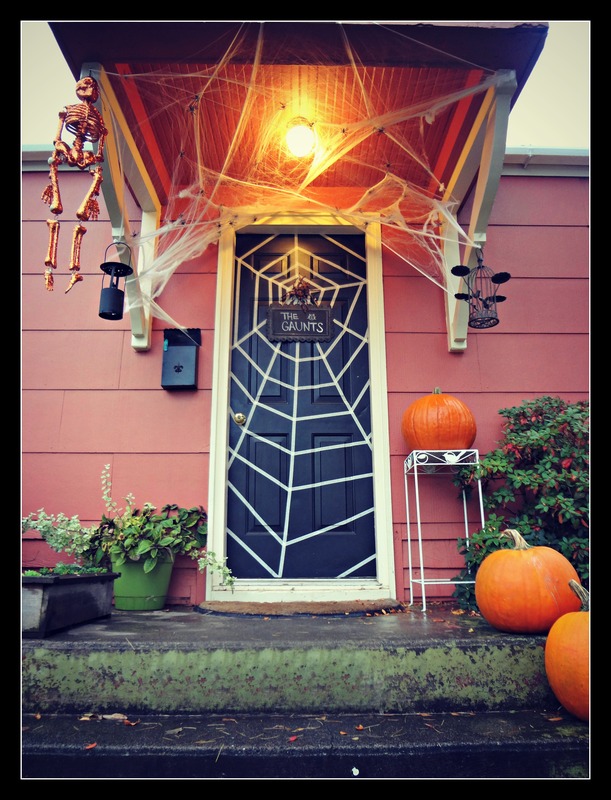 Seriously folks, if you have a dark colored door, and 79 cents to buy 1 inch masking tape, your front door can also be this cute. We have a pretty awesome cardboard coffin and fog machine that we will bring out for trick-o-treaters. Speaking of, we should probably stock up on candy from Costco before it’s all sold out! Mr. Gaunt has selected his Halloween movies that he will watch 13 day up to Halloween, and we are making costume plans! I’m going to be a witch, and he is going to be the Notorious BIG….seriously. Pumpkin carving will happen this week! YAY FOR FALL! Hey – your masking tape spider web is 10 times better than the masking tape spider web at the Dakota arts in ballard- who knew that was a chain?! I totes didnt know that! This blog was once a "twenty-something weight loss blog name For The Love Of Skinny" but now its a just a journal for our family. I'm Morgan! I'm married to the dopest man you will ever meet Mr. Gaunt. We live in Bellingham Washington with our cat (and by cat I mean angelic unicorn of a creature) Hula, and our sweet daughter Vada (born 11/12/13). Stick around to read about our daily life, our fave things, our house project, thrift store obsessions, and feelings on motherhood, family, and self discovery....er something like that. WHAT ARE YOU TALKIN ABOUT?